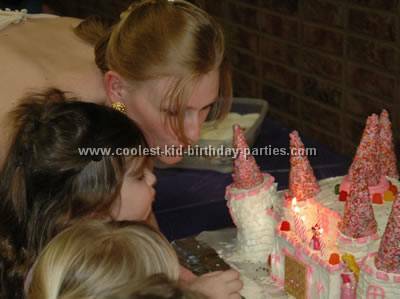 It was a Royal Celebration for all in honor of Princess Anastasia’s 4th birthday. My daughter had been asking for a “princess theme party ” since she’d blown out the candles on her 3rd birthday cake (which had been a Care Bear) and I was eager to comply with the idea and be creative. As her birthday approached I began to brainstorm. I’d had ideas for a princess party theme but usually somewhat vague and was in search of examples leading me to research on the web. What I can say of what I found is that there are many truly amazing and creative parents out there. I’m so glad they decided to share! I knew that my daughter wanted to dress as Sleeping Beauty and definitely had the typical love of Disney princesses. However I needed to make it fun for boys too as she has a little brother and many young boys in her family and her playschool class. I opted to make the party a royal ball that all “royal subjects” were requested to attend and invited to dress “in their favorite royal attire”. The invitations were lengthy (considering most invites were 3 or 4 years old). But they were done to give the feel of real royalty a real ball. I designed the Princess party theme invitations using a very simple crown line drawing at the top of a half sheet filled with fancy writing (I believe it was Bickley Script?). I printed on an array of colors so girls received pinks and purples and boys received blues greens oranges. The paper itself was actually one used for scrap booking not printing, very fibrous and slightly transparent. Once you wet the edges they tear and leave it looking softer and more aged. I used rubber cement to adhere each print onto a plain white half sheet of computer paper. I then used scrap booking scissors to give the top and bottom edges more character. Each invitation was rolled and fastened with a gold label and ribbon. Each label was addressed to “Princess ___” or “Sir ___” and most of them were hand delivered as the children were being dropped off at school. Once the Princess party theme invitations for the princess theme party were out it was time to get my act together. I chose the activities. 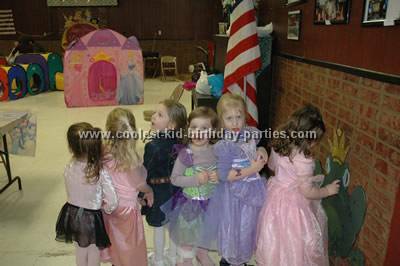 Considering the number of young children I wanted to invite to the Princess party theme, I wanted them to have plenty of free play. So I chose to purchase a pop up play tent castle made by Play hut. I searched and compared many to find the perfect one as this was going to be a special gift for my daughter as well and it needed to be big enough to accommodate a few children at a time. I found the perfect one offered online by Wal-Mart. It’s about 5x5x5 with a mesh window, one tunnel hole and one door opening with mesh curtains. The front and one side display the Disney princesses on a light pink background and the other sides are just dark pink. It includes 2 little flags you can place in the front roofline. It’s really cute and quite big but so easy! Pops up in a minute and takes down just as quickly for easy storage so now we take it out whenever she wants to play in it and I don’t mind because when she’s done we just put it away no fuss and no big permanent intrusion on space. I highly recommend play hut structures. 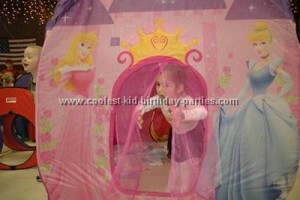 As a matter of fact we had gotten my son the MegaPlace Play hut set for his birthday last year so I connected those tents and tunnels to my daughter’s new castle to form a whole play land kingdom for the kids to enjoy at the party. We also purchased some Disney Princess Music CD’s to play throughout the Princess party theme. 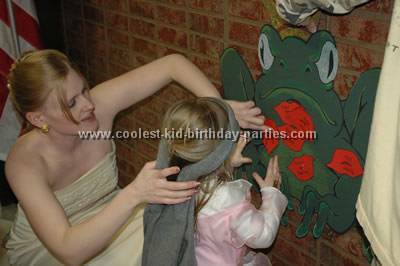 Some other activities included the Kiss the Frog game. I found that suggestion online and decided to go ahead and make my own. (Which we actually used at another princess theme party so I think I’ll hold on to that for anyone else who happens to have a little princess.) Created the big frog and just small kiss lips from red construction paper. I purchased a crown/tiara craft set at an AC Moore and bought lots of extra glitter glue pens. This way the kids could all make their own crowns as a part of their goodies to keep. Speaking of goodies to keep! Little princesses each received a goody bag with a necklace, bracelet, rings, brush, sticker, blower toy and marshmallow candy stick. In addition to receiving a glo-stick bracelet and a little cup that says princess on the front with a crown (found at oriental trading company). Little knights and princes received a dragon figure, sword, bubbles, knight stickers, kindness coins and marshmallow stick in addition to a glo-stick bracelet and a golden knight cup (also from oriental trading). We had temporary tattoos available and lots of balloons to play with. I couldn’t find a dragon piñata (and I’m not particularly a huge fan of piñatas anyway) so instead I spent some time inserting little trinkets and candy into balloons to be blown up and thrown around and eventually popped to get more goodies. (side note: I had purchased a bunch of dollar store balloons that I used for this because I did want them to pop fairly easily however they popped a bit too easily and I would recommend getting some better balloons for that.) I also had bought twist balloons to make swords and wands for all the kids. But the party was so busy we never even got around to that! The day of the princess party theme I was lucky to have had family and friends help with the setup. We used a town community building which supplied chairs and tables etc. We covered each table with different color plastic covers- pink, purple, and green, blue, yellow. The centerpiece of the Princess party theme was a princess balloon held on a nice sparkly weight surrounded by Hershey’s Nugget candies which I had made custom labels for. The labels consisted of 3 designs all with the Disney Princesses and saying things like “Thanks for coming to the ball!” or “Princess Anastasia’s 4th Birthday Ball, March 3 2007″. We setup a buffet line of food with the Castle cake at center. The food choice consisted of: Sloppy Joes, Hot dogs, PB&J, heart shaped cutouts, chips, pretzels, cheese pepperoni and cracker tray- veggie tray (celery, carrots, tomatoes, peppers, broccoli and dip) a huge bowl of fresh strawberries and grapes, homemade pasta salad (that was a hit!). Brownies cookies “Dirt” dessert in a decorated stainless bowl made to look like jewels in the dirt. (We used shiny gummy bears instead of gummy worms.) For drinks there was juice and soda. It worked out very well and everyone seemed to enjoy. My little princess was dressed in a sleeping beauty costume. And I had found knight’s chest plates and shields and armor etc at the local dollar store; however my son wasn’t too interested in dressing the part. I dressed as Belle and my daughter’s godmother dressed as Cinderella for some added fun to the theme. (My dress was $20 at the local Salvation Army and her godmother wore a dress she’d worn to our senior prom). Another friend threw together a last minute princess costume to help us be festive. Most guests arrived in their own royal attire with parents in tow. They were greeted by family members who asked the child’s name. And then proceeded to mark it on the bottom of their special cup. The Princess party theme was held from 3-6pm. So if anyone needed naps prior they might be able to do that. And those with early bedtimes were able to get home in plenty of time. Once everyone appeared to be present we opened up the craft table. Parents, adults and teens were on hand to assist with the crown project. 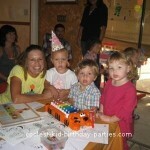 Of course with the number of children in attendance there was plenty of free play going on throughout the whole party. The buffet was available throughout also but after everyone appeared to have eaten. We did the kiss the frog game and chose a few winners. Soon after the cake was cut and people began to disperse. We chose not to have a gift opening right there due to the fact that there were so many and it’s just more fun to let the kids play! Later that night at home my daughter got to get in her pajamas and opened in front of her close family. The whole time the party took place one of my sisters took pictures. We also took pictures as she opened her gifts at home. Later I was able to sort through all the photos. I found one of each of the kids enjoying the party. I used these to make a personalized thank you postcard. The child’s picture appeared on the front with the words “Thanks _____!” The back simply thanked them for sharing in the celebration and specified the gift they had brought and something my daughter liked about it. Each was cut out using the scrap booking scissors (same as the cut done on the invitations). Many of the moms liked the thank you notes. 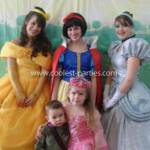 All in all the entire Princess party theme was a success and we had a lot of fun throwing it. I think it will be one that Princess Anastasia Grace never forgets! The Princess party theme ideas and photos in this section have been graciously submitted by readers like yourself. If you’ve got some cool party ideas and photos to share, we’d love for you to send them over. You’ll be taking part in creating the Web’s ultimate kids birthday party ideas resource that’s ALWAYS FREE for everyone to enjoy! Thanks! 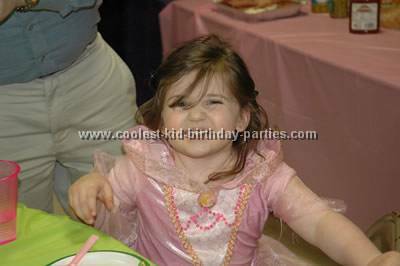 Submit Your Own Princess Party Theme Ideas Here!